Many of you joined us (virtually) at Tech Field Day 9 back in June for the world premiere presentation of Infinio and their “downloadable storage performance” for VMware environments. In the month and a half since we met Infinio, I’ve been planning to write about their presentation and their product. It’s an interesting technology, and something I can see being useful in small and large environments, but I hadn’t gotten around to piling the thoughts into the blog. Infinio is a two year old, 30ish-person startup whose Accelerator product is designed to be an easy drop-in to your VMware environment. They’re focusing on making the product easy to try (including substantial engineering focus on the installation process), simple and affordable to buy, and visibly useful to your environment as soon as possible. CEO Arun Agarwal talked up the focus on the installation process, but even more interesting was his focus on the trial and sales model. This seemed important at the time, but as time passed, I really appreciated the idea more. Just this past week, I downloaded a “free” VM from a much larger company, only to be told in a pushy followup email that I need to provide a phone number and mailing address and get trial licenses and talk to a sales guy on the phone to do anything with the “free” VM. It was annoying enough to get to this point, and I’m disinclined to actually buy and use that product. I want a company to provide (1) enough information on their website for me to understand the product, (2) a hands-off model for acquiring and trying out the product (even if it’s at 2am on a Saturday because I can’t sleep and I’ve got a hundred servers sitting idle in a datacenter to play with), (3) smart and non-pushy people to help me with understanding, evaluating, and maybe buying the product if I do decide to move forward–when and if I need them, and not the other way around, and (4) a product that really solves the problem. Infinio plans to provide all these things. You can download the trial without giving a lot of information (or any, as I recall), and you can buy your licenses with a credit card on the site. This would be a refreshing model, and I’m optimistic about their being able to do it. I was wondering that too… and seeing the phrase “downloadable storage performance” a week or so before the visit, I was dubious. 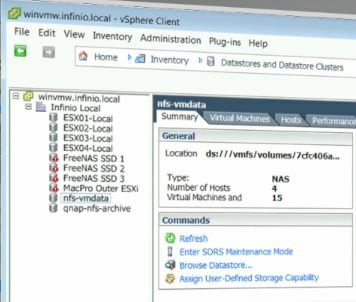 The Infinio Accelerator is a virtual NAS (NFS v3) accelerator for VMware. It sits between the vmkernel interface and the storage server on each host, providing a shared, deduplicated caching layer to improve performance across your systems. It also works transparently to both storage and server, so you don’t change your storage settings or ACLs (great for those of us who have siloed storage, networking, and virtualization management teams, and all the efficiencies they provide). And possibly most impressive of all, you don’t have to reboot anything to install or remove the product. The management console allows you to toggle acceleration on each datastore, and more importantly, monitor the performance and benefit you’re getting from the accelerator. They call out improvements in response time, request offload, and saved bandwidth to storage. Peter Smith demonstrated the Infinio Accelerator for us live, from downloading the installer from the Infinio home page (coming soon) to seeing it make a difference. The process, with questions and distractions included, came in around half an hour. After the relatively brief installation (faster than checking for updates on a fresh Windows 7 installation, not including downloading and installing all 150 of them, mind you), Peter brought up a workload test with several parallel Linux kernel builds in 8 VMs, demonstrating a 4x speedup with the Accelerator in place even with the memory per VM halved to make room for the Accelerator. 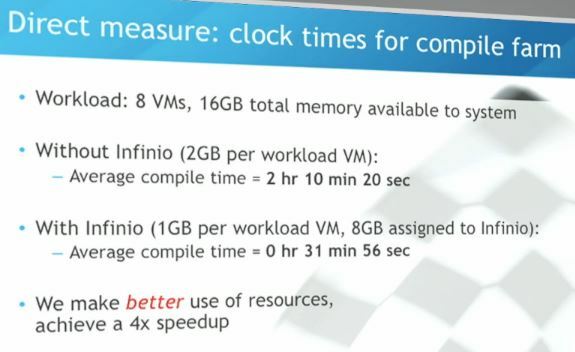 An aside about making room for Infinio: The accelerator will eat 8GB of RAM, 2 vCPUs, and 15GB of local disk space on each hypervisor host you’re accelerating. It will also use 4GB RAM, 2 vCPUs, and 20GB of storage for the management VM, on one of your hosts. So if your virtualization lab is running on your 8GB laptop, you’re gonna have a bad time, but a quad-core lab system with 32GB of RAM should be practical for testing. A typical production hypervisor host (128GB or more) will probably not notice the loss. And a further aside about the demo system. As a big fan of Simon Gallagher’s vTARDIS concept of nesting hypervisors, I was pleased to see that the Mac Pro the Infinio folks rolled in for the demo was effectively a vTARDIS in itself. This is a pretty cool way to protect your live demo from the randomness of Internet and VPN connectivities and the very real risk that someone will turn your lab back at the home office into a demo for someone else, if your product lends itself to being demonstrated this way. The team at Infinio were very open to the suggestions that came up during the talk. They have a “brag bar” that offers the chance to tweet your resource savings, but they understood why some companies might not want that option to be there. Some of us work (or have worked) in environments where releasing infrastructure and performance info without running the gauntlet of PR and legal teams could get us punished and/or fired. They took suggestions of external integration and external access to the product’s information too, from being able to monitor and report on the Accelerator’s performance in another dashboard, to being able to work with the Accelerator from vCops. And they’re working on multi-hypervisor (read: Hyper-V) support and acceleration of block storage. Just takes enough beer and prioritization, we were told. 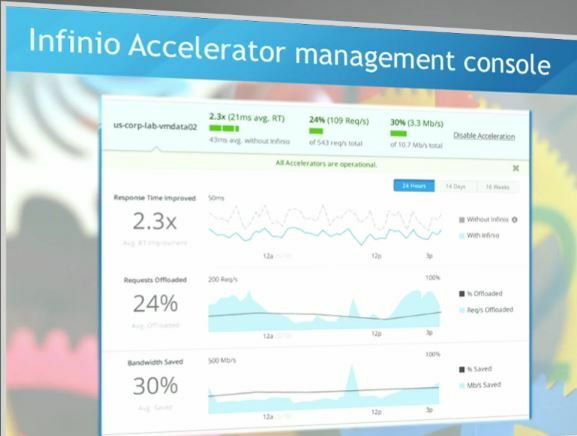 Infinio is releasing a more public beta of the Accelerator at VMworld in San Francisco in just a couple of weeks. Stop by and see them if you’re at VMworld, or watch their website for more details about the easy-to-use trial. You can sign up to be notified about the beta release, or just watch for more details near the end of August. The pricing will be per-socket, with 1 year of support included, and hopefully it will be practical for smaller environments as well as large ones. We will see pricing when the product goes to GA later this year. I’m planning to get the beta to try out in my new lab environment, so stay tuned for news on that when it happens. And if you’re one of the lucky ones to get a ticket for #CXIParty, you can thank the folks from Infinio there for sponsoring this event as well. And I may see you there. Disclosure: Infinio were among the presenters/sponsors of Tech Field Day 9, to which I was a delegate in June 2013. While they and other sponsors provided for my travel and other expenses to attend TFD9, there was no assumption or requirement that I write about them, nor was any compensation offered or received in return for this or any other coverage of TFD9 sponsors/presenters. Update: When we talked with Infinio in June, they planned to include 3 years of support with the initial purchase. They are now planning to include 1 year with renewals beyond that being a separate item. This should make the initial purchase more economical, and make budgeting easier as well. This entry was posted in Storage, Tech Field Day, Vendors, Virtualization and tagged infinio, tech field day, tfd, tfd9, vmware, vtardis by rsts11. Bookmark the permalink.